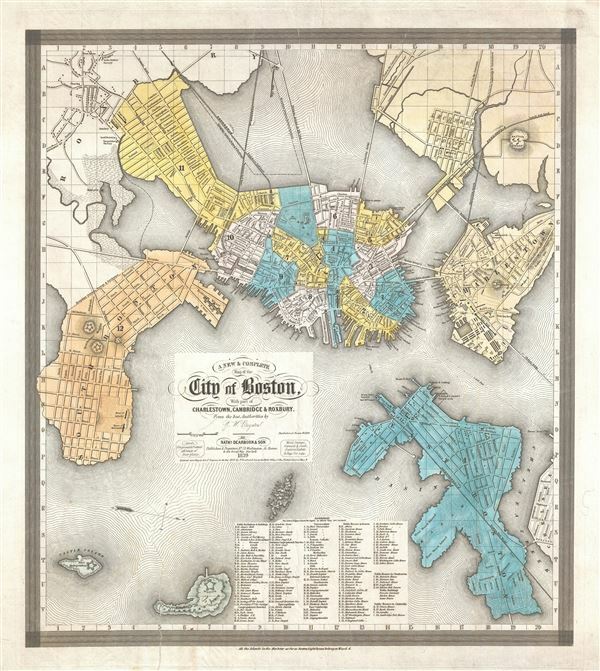 Scarce separate issue map of Boston. A separately issued 1839 map of Boston offered in its scarce first edition. This very uncommon map was compiled by George Washington Boynton for the Boston publisher Nathaniel Dearborn. Presented with an unusual westward orientation, this map covers early 19th century Boston and the surrounding cities of South Boston, East Boston, and Charlestown with parts of adjacent Cambridge, Roxbury, and Chelsea. When this map was drawn the Mill Dam had been completed, but Back Bay landfill and other reclamation projects of the mid-19th century were not yet planned. The map identifies rail lines (complete with tiny engraved trains), some property owners, businesses, and important buildings. A reference table at bottom center details government buildings, churches, and public houses. This map appeared in many issues through the late 1950s, this being the first and scarcest edition. It is noteworthy that this is a separately issued map. It was never folded or bound into a book of any kind, so it is exceptional to discover an example that has been so preserved. Later issues appear folded and printed on very thin onion skin paper. The earliest editions were printed via steel plate, but sometime in the early 1840s, the printing was transitioned to lithographic stones which were used and revised until the final issues in the 1850s. Nathaniel Dearborn (1786 - November 7, 1852) was a New England engraver and publisher based in Boston during the first half of the 19th century. Dearborn was born in New England in 1786 to inventor Benjamin Dearborn; his siblings included John M. Dearborn and Fanny Dearborn Hanman. In Boston he learned engraving from Abel Bowen. By 1814 Dearborn had printing and engraving offices on School Street; later moving to Market Street (ca.1823), State Street (ca.1826-1831) and Washington Street (ca.1832-1852). Dearborn died November 7, 1852, in South Reading. His son, Nathaniel S. Dearborn, continued as an engraver and printer in Boston, working on Water Street (ca.1847-1851) and School Street (ca.1857-1868). N.S. Dearborn exhibited several printed specimens in the 1850 exhibition of the Massachusetts Charitable Mechanic Association. His grandson S.B. Dearborn also worked as a printer. Good. Professional restoration of several closed tears, one large and extending from lower margin into lower left title area, and a second smaller tear extending from top edge of paper to printed border of map. Other repaired tears extremely minor. Old color. Krieger, Alex and Cobb, David, Mapping Boston, p.198, pl.36. Leventhal Collection, (1841 edition) G3764.B6 1841 .B692, (1850 edition) G3764.B6 1850 .B69.